Born Arthur Henry Ward in Ladywood, Birmingham, in 1883, of Irish parents, he changed his middle name to Sarsfield when his mother died in 1901 (she had believed herself descended from the Irish Jacobite hero Patrick Sarsfield, according to Rohmer’ biographer Van Ash); he wrote under the pseudonym Sax Rohmer. (A “sax-roamer” is a wandering blade: a free-lance). 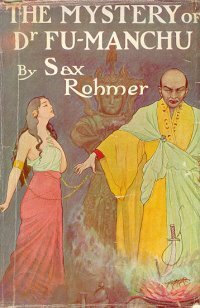 Sax Rohmer became best known for his Fu-Manchu stories (later and more normally written without the hyphen). Robert Bickers, in the Oxford Dictionary of National Biography, notes that “as a thriller writer Ward is of little importance. His prose is pompous and ponderous, and his plotting thin, predictable, and repetitious”, but does credit him with “an instinctive knowledge of his market”. His Fu Manchu character, usually noted today as a premier example of racial stereotyping, clearly caught the public imagination; later in life, until his death in 1959, Rohmer lived on the income derived from the numerous film, radio and television adaptations. Fu Manchu was one of the earliest super-villains, a successor of the much more shadowy Professor Moriarty. The opium dens of Limehouse, frequented on occasion by Sherlock Holmes, made frequent appearance in earlier Fu Manchu stories; the villain later moved to the United States, once Rohmer had appreciated the importance of the American market. There were science-fictional elements in the Fu Manchu stories: his plot to control the Si-Fan, a secret Chinese organisation, and to bring them to control the world, was aided by his longevity treatment. But the thirteen Fu Manchu novels Van Ash; fifteen according to Bickens, while Clute seems to list fourteen) were outnumbered by his other novels, where the science-fictional elements were more obvious. Apart from the series about Sumaru, an oriental villainess, there was the Gaston Max series, beginning with The Yellow Claw (1915), set in and around a fortress protected by death rays, and The Emperor of America (1929), in which a bunch of villains, with the help of various inventions, plot to dominate the world from their base under Manhattan. Ward grew up in London, to which his parents had moved when he was three, and had various jobs, including as a journalist. Among his earlier published fiction were fantasy-related stories, including the very first: “The Mysterious Mummy”, which appeared in the Christmas Issue of Pearson’s Magazine in 1903. At this time he allegedly joined various occult societies, including the Golden Dawn and the Rosicrucians. He also developed links with the world of the music hall: he wrote sketches and songs. In 1909 he married Elizabeth Knox, a juggler, and the sister of Teddy Knox (of the Crazy Gang); he published a collection of stories in collaboration with George Robey, and wrote the “autobiography” of the popular comedian Little Tich. He first used the pseudonym of Sax Rohmer with the publication of one of his songs in 1908, and his first fiction under that name was a serial which appeared in Cassell’s Magazine in 1912: ‘The Sins of Séverac Bablon’, an antisemitic fantasy. In that year too, came the first serialisation of a Fu Manchu story. It came out in book form in 1913 from Methuen: The Mystery of Dr. Fu-Manchu. E.V. Lucas, a reader for Methuen, had tried hard to persuade them not to publish the book; something that Rohmer would remind him of when, later, they became friends. After his war experiences, Rohmer went on the first of his trips to America, and discovered how popular he had become there. By 1919, three Fu Manchu books had been published in the UK, and each time UK publication had been followed by a US edition. His second visit to America in 1921 coincided with the release of the first Fu Manchu movies, and Rohmer began to be personally involved in productions for the stage, including a stage version of Verne’s Around the World in Eighty Days. Sax and Elizabeth moved to America for a few years in 1947, but despite his efforts, the appetite for Fu Manchu seemed to have diminished. He died in University College London Hospital in 1959, and was buried in Kensal Green. For the above I am mostly relying on Robert Bickers’ piece in the Oxford Dictionary of National Biography and on Cay Van Ash and Elizabeth Sax Rohmer, Master of Villainy: A Biography of Sax Rohmer (Bowling Green OH: Bowling Green University Popular Press, 1972). Bickers called Rohmer’s wife “Elisabeth”; I am presuming that Van Ash, although not always wholly trustworthy (he tended to believe what Rohmer told him), knew how to spell her name.